Two weeks after a Myanmar newspaper ran a story headlined "When bags of money replace judges in court"—highlighting corruption in the judicial system—one of its reporters was thrown in jail in a conviction the daily suggested was politically motivated. In Thailand, two journalists were slapped with criminal defamation charges—and face jail terms of five years each—after they cited a Reuters news agency's investigative report alleging the involvement of Thai naval security forces in the trafficking of Rohingya Muslim asylum-seekers fleeing Myanmar. As the year winds down, governments in Southeast Asia are not relenting in their efforts to curb media freedom, press watchdog groups say. When overseas activist groups were paying year-end tributes to democracy-seeking Vietnamese bloggers at a ceremony in Paris this month, the one-party communist government in Hanoi unleashed plainclothes police to beat and rough up online writers in Hanoi and Ho Chih Minh City. In Malaysia, a weekly paper that reported on Prime Minister Najib Razak’s “big spending” ways has been suspended indefinitely, while in neighboring Singapore a news site was forced to close down after it rejected “onerous” new government registration requirements. Press freedom in Southeast Asia has been "deplorable," according to the Southeast Asian Press Alliance (SEAPA) in a recent report, summing up state violations of freedom of expression amid what it called a "bleak picture of impunity" in the region. 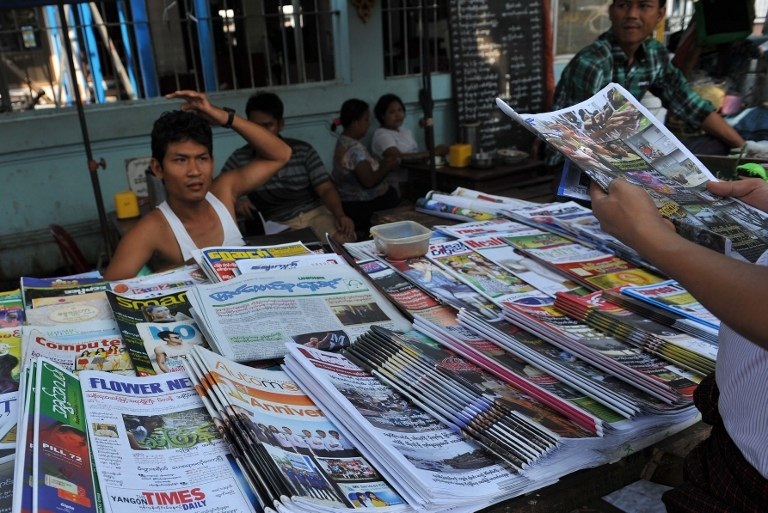 Concerns over media curbs are emerging particularly in Myanmar, even as it continues to receive bouquets for political and other reforms it has been implementing since 2011 after decades of brutal military rule. On Dec. 17, a journalist with the Rangoon-based award winning press group Eleven Media was ordered jailed for three months after she was convicted by a court for trespassing, criminal defamation, and using obscene language. Ma Khine is believed to be the first reporter to be jailed since President Thein Sein’s reformist government began releasing jailed journalists and lifting long-standing media restrictions in 2012. Her jailing resulted from a suit filed by a lawyer after an argument allegedly took place while the reporter was seeking comments on an alleged video piracy case. Many questioned the timing of the judgment, which came two weeks after the Eleven Media journal published the article "When bags of money replace judges in courts," using for the first time what it said was evidence to highlight examples of corruption in the judiciary. Offenses such as trespassing and defamation usually result only in fines in Myanmar. "This suggests a first step taken by the judicial sector to control the media during the post-dictatorship era," Eleven Media said, terming the conviction a "warning bell for journalists and press freedom in Myanmar." In neighboring Thailand, the filing of criminal and other charges against two journalists accused of defamation in connection with a report on military involvement in the trafficking of Muslim Rohingyas fleeing persecution in Myanmar has also come under criticism, including from the UN human rights envoy. If convicted, Phuket-based journalists, editor Alan Morison, and reporter Chutima Sidasathian, could face up to two years' imprisonment for defamation and five years for breaching the Computer Crimes Act for publishing the article on independent news website Phuketwan. It is the first time the Thai military has used the Computer Crimes Act to sue journalists, according to Phuketwan. The Computer Crimes Act is written so that those who run the computers that "import [unlawful] computer data" are as guilty as those who created that content, the New York-based Committee to Protect Journalists (CPJ) says. "In other words, just having a computer carry disloyal content is as great a crime as saying it yourself. Even deleting the messages does not eliminate the guilt. The moment the words are posted via your computer, you are guilty." "Rather than shooting the messenger, the Royal Thai Navy would be better suited launching an internal investigation into the serious allegations of abuse that have been raised," said Shawn Crispin, CPJ's senior Southeast Asia representative. "This type of legal intimidation aims ultimately at discouraging media reporting on allegations of serious human rights abuses," he said. The U.N. has also weighed on the case, warning that it would have a "chilling effect" on press freedom in Thailand. In Vietnam, the government continues to employ brutal tactics to harass online media in the country, where nearly all newspapers are controlled by the ruling Communist Party, critics say. Early this month, plainclothes policemen brutally beat several dissident bloggers when they gathered to mark Human Rights Day in Ho Chi Minh City and Hanoi. They also burst green balloons carried by the bloggers with the message “Our human rights must be respected” and tore up copies of the Universal Declaration of Human Rights the online writers had planned to distribute to the public. “We condemn the police violence against cyber-dissidents and netizens,” Reporters Without Borders said. “The only thing these disgraceful methods achieve is to demonstrate the weakness of the authorities, who are using all possible means to gag those speaking out against the regime." Vietnam is holding 18 journalists, up from 14 a year earlier, as authorities intensify a crackdown on bloggers, who represent the country’s only independent press, the CPJ said in its latest annual census which identified 211 journalists worldwide jailed for their work, the second worst year on record. In the survey, among Asian nations, Vietnam is behind only China, which has imprisoned 32 reporters, editors, and bloggers. The media suppression climate in Southeast Asia also extends to the more developed states in the economically booming region. In Malaysia, the government of Najib this month suspended the weekly magazine The Heat "indefinitely" for allegedly violating the terms of its print permit just a few weeks after it ran an article headlined "All eyes on big-spending PM Najib," giving examples of lavish spending by the prime minister and his wife, especially when traveling abroad. Veteran opposition leader Lim Kit Siang said The Heat's suspension was an example of Najib reneging on his specific promise of democratic reforms to unshackle the press from tight restrictions, warning that Malaysia could plunge further in its ranking in the 2014 Press Freedom Index. Last year, Malaysia fell by 23 rungs to be ranked at 145 out of 179, the worst since the start of the annual benchmark by Reporters Without Borders in 2002. Malaysia lies lower than neighbors Brunei, Cambodia, Thailand, and Indonesia in the index. "Is Malaysia heading towards the nation's lowest ranking in the history of the Press Freedom Index, even lower than Myanmar, for the coming new year in 2014?" Lim asked in a statement. Myanmar is ranked 151 at present. The wealthy Singapore city-state, which is languishing at an abysmal 149th place in the index, has also not been spared from criticism of curtailing the media. The forced closure this month of Breakfast Network, a leading socio-political website, has underscored concerns among netizens and media groups over what they consider to be overly intrusive government requirements for the press to operate. The website is the first political site to be banned in 17 years, marking an end of "light-touch" Internet regulation in the city-state, according to Cherian George, a former senior journalist with the Singapore Straits Times and now a local academic. The website was ordered by the government media regulator to register by Dec.17, but its editor said the government’s technical requirements and registration forms contained too many vague provisions. "For all the thunderclouds and occasional lightning strikes that bloggers faced in Singapore, we at least used to be able to point to one, clear silver lining: Not one political site had been banned in 17 years of 'light touch' Internet regulation," George said in a blog post. The "silver lining is officially history," he said, adding that "Singapore has now stumbled into the company of authoritarian regimes that are prepared to outlaw politically inconvenient blogs." "Although it could prove to be an unintended anomaly, the Breakfast Network’s death by red tape is nonetheless a landmark event in the brief history of online regulation."